Many thanks to Tony (center) for this meeting's excellent theme! Looking on are (from L-R) Jerred, Bill K, Graham and Mindy. Mindy gave a nice talk on her use of fountain pens in her artwork. An assortment of stationery. notebooks, and journals that our members brought in. A nice group shot (thanks, Richard!) taken during the meeting. From left to right: Leo, Tony, Graham, Bill K, Ralph, Bruce, Peter (foreground), Chris Tucker, Bill M, Alejandra, Maja , Stuart, Jerred, Penny, Aaron, Christopher and Charles (partly out of shot). Not pictured but present were: Richard, Charles, Mark, Ben R, Greg, Mindy, James and new VPC member Bob. 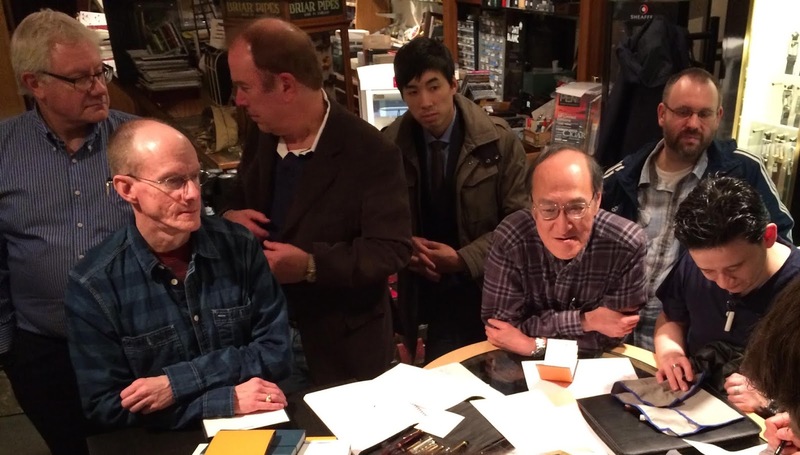 We had a grand total of 24 VPC members at our February meeting, and one guest---Chris Tucker from the Ottawa Fountain Pen Society. Our topic was "What do you write?" and we heard a variety of uses for our fountain pens, as well as some interesting choices for paper. Thanks again to Tony for the topic! --Tony uses his fountain pen for journalling and taking notes at work. He likes using a Rhodia Webnotebook. --Jerred takes interview notes at work and uses Staples Bagasse looseleaf paper and Xerox 24 lb copy paper. --Peter uses his fountain pens for journalling and marking exams, and he uses various journals and the Rhodia Webnotebook. --Leo also journals and uses a Filodex. --Ben R. uses his fountain pens for calligraphy, which he does at his friends' request. --Christopher R. has been journalling since 1960, and also uses fountain pens for illustrations (something he did professionally). --Stuart likes to send notes and likes Crane notecards. For other writing purposes, he uses Clairefontaine and Rhodia paper. --Aaron uses his fountain pen for work-related notes and uses Rhodia and Clairefontaine paper. --Alejandra is a big paper fan! She uses her fountain pen to jot down ideas and notes. Her preferred paper is G. Lalo (Verge de France), Notelets for journalling, Clairefontaine (she bought their Frida Kahlo edition) and her Midori Travelers Notebook. --Bruce uses his fountain pens for meeting notes and likes Rhodia paper, and especially his Rhodia Meetings Book. --Ralph only uses his fountain pens for letter-writing and he likes using bond paper. ---Maja also likes writing letters with her pens, as well as doing crossword puzzles with them. ---Graham likes using his Rhodia XE book. --Bill K uses his fountain pens at work to write down orders, and he also loves journalling (having done it since 1961) in looseleaf lined paper. --Mindy brought in some really cool drawings she did with her fountain pens. --James K. uses his fountain pens for writing down formulas. --Chris Tucker (from the Ottawa-area pen club) showed us some of his fountain pens and an interesting notebook called the “Decomposition Book” made by Michael Roger of Brooklyn, NY (info here), which he purchased at WonderPens in Toronto.